Many of the residents of America’s older central cities want more Greenspace in their own and their families’ lives. They crave the cooling, stress-relieving beauty of street trees, the relaxation and recreation offered by neighborhood parks, and the chance to grow their own food and socialize with their neighbors in community gardens. This desire to improve the social, economic, and even the ecologic condition of neighborhoods is unsurprising. Cities like Los Angeles, San Francisco, Chicago, St. Louis, Atlanta, and New York are woefully short on public Greenspace. Even seemingly well supplied cities turn out to be deficient at the scale of the neighborhood because a large portion of their greenspace is concentrated into one or a handful of large parks, which most residents find difficult to access. Although these larger greenspaces are valuable and deserve continuing support, they cannot substitute for smaller features within easy walking distance of every resident. People need to be able to experience parks, street trees, and other green settings at a temporally and spatially comfortable scale – the everyday and in their neighborhoods – not just occasionally and after a trip across town. The following case-studies are aimed at the resident wondering if his or her community could have more greenspace, the advocate who may be seeking more street trees or a community garden, and the professional planning the urban landscape. The emphasis is on practicality, and on small spaces, since it is these that are most likely available for greening in central cities. As the studies demonstrate, easily accessed greenspace is not an unattainable, utopian dream. New parks, community gardens, and other neighborhood greenery appear regularly in a wide variety of urban settings. Nineteenth and early-twentieth-century Americans invested heavily in large and small parks, parkways, street trees, and greenbelts because they understood the myriad social and economic benefits generated by urban nature. It is time to once again press the agenda of park makers and advocates like Frederick Law Olmsted so that every city dweller can live within walking distance of a park. The cases developed below follow three basic design, funding, construction, and management models: largely public; a relatively balanced blend of public and private; or, largely private, but they are presented in two broad categories: conventional; and, novel types of places. Nevertheless, each is a success story, the tale of a central city community that augmented its greenery. Every study is necessarily brief and cannot explore all the questions, struggles, despair, and triumph in each case, only a handful of highlights. The studies demonstrate that creating parks and similar features is possible, but often takes much time and effort; communities must be patient and persistent in the pursuit of greenspace. Grand Hope Park is located in a redeveloped block in the downtown area known as South Park. 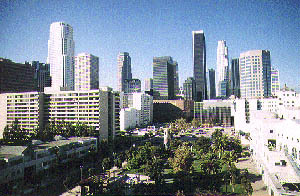 Owned by the city’s Community Redevelopment Agency (CRA), the 2.5 acre park shares its site with the Fashion Institute of Design and Merchandising plus the Renaissance Tower apartments. The school and residential building, along with other nearby apartment and office buildings, form Grand Hope Park, Inc. This Business Improvement District (BID) is a non-profit organization that finances and runs the park under a 50-year leasing agreement with the CRA. The city hopes the park will spur further redevelopment in the district and act as a model for the private management of public facilities. The site was set aside for a park in the 1970s but little was done until the late 1980s when landscape architect Lawrence Halprin was engaged to design the grounds. Construction began during 1989 as the CRA provided $3 million from funds paid by nearby project developers for transferable development rights assigned away from the park and three building sites. Delayed by the bankruptcy of the park’s builder in 1992, financial problems at the Renaissance Tower, and a controversy over a fence surrounding the site, the park quietly opened in 1994. Today, office workers and residents from nearby buildings enjoy the park every day of the week. Besides Halprin, the park’s design was influenced by three visual artists, four composers, and two poets. The 53-foot clock tower and series of cascading fountains create a harmonious blending of artificial and natural sounds that ring throughout the site. Bronze statues in the shapes of coyotes, a hawk, and a snake grace the park’s grassy knolls. And, a colorful playground provides recreational opportunities for the children from nearby residences while an amphitheater furnishes a setting for numerous entertainments. Like many cities with older neighborhoods, Philadelphia has unmaintained vacant land where buildings once stood. Disinvestment, growing unemployment, disinterest, and changing demographics have buffeted these areas, leaving unplanned and unbudgeted vacant land. However, the Pennsylvania Horticultural Society has toiled to help green these empty spaces through one of the most ambitious community gardening programs in the U.S. The society is best known for its horticultural publications, public education programs, and especially its Philadelphia Flower Show, but it also runs Philadelphia Green, the nation’s largest private beautification effort. With a staff of 45 and an annual budget of $3 million, some of its programs are aimed at traditional parkway and park greenspaces, but the majority focus on communities desperate for greening plus jobs, retail outlets, housing, medical facilities, and schooling. Philadelphia Green provides technical assistance and some materials to help residents implement community gardens, street tree plantings and other sorts of neighborhood greening projects. West Philadelphia’s Warrington Community Garden, in a struggling, working-class neighborhood pock marked by vacant lots, is an example of their assistance. During the 1970s, residents of the neighborhood began tending small gardens on a one-acre, privately owned parcel. The owner was amenable, even encouraging, and ultimately offered to give the land to the gardeners in the mid-1980s. Unfortunately they had no legal vehicle to accept the donation. 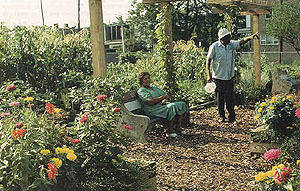 In 1986, Philadelphia Green helped Warrington and other local gardens create the Neighborhood Gardens Association (NGA), a land trust, to ensure that community gardens received long-term protection. To date, NGA has purchased 21 gardens. Nevertheless, the NGA appeared too late for the Warrington garden because the property was sold and then sold again to a developer who requested permits for new townhouses on the property. The local residents fought the development asking why their garden had to be destroyed when there were many untended, trash-filled vacant lots nearby. They were successful in this struggle but recognized that a similar situation could arise again shortly if they did not acquire title to the land. Fortunately, NGA began negotiating with the owner and raised $20,000 from foundations while the gardeners themselves raised $15,000. With these funds, NGA was able to purchase the land and is now holding it in perpetuity for the gardeners. They cannot be thrown out of their garden now. With this solid foundation, the Warrington gardeners have since gone on to expand the garden and create a revenue-generating tree nursery which brings money into the neighborhood and provides an opportunity for young people to learn valuable skills for productive lives.